There are many different types of roofs that people choose for their homes that knowing the best type of roof for your house is not always easy. Today most of the decision is based on aesthetics. Many of the different roof types were built with a purpose in mind. Some roofs are made to withstand a certain type of weather where as there are other types of roof that are made for a specific unusual purpose such as avoiding higher taxes. There are also some different coverings for your roof. 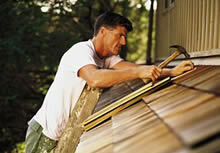 These are a matter of personal preference as well as to which type of roof will serve you the best. Roofs come in many different shapes and sizes. The simplest style of roof is called the shed roof. This is a single plane that is slanted to allow water to run off the top. Despite their classic nature, today they are used for houses with contemporary designs. If you add another side to the shed roof and make it come to a point, then you have the gable roof. This roof is named after the gable, which is the triangle shape that it makes at the ends of the house. Another roof that is derived from the gable style is the saltbox roof. This originated in New England was designed because the taxes for 2 story homes were much higher from that of one story homes. In the case of the saltbox, one side of the roof is extended and goes approximately 6 foot from the ground. Because of this, saltboxes could not be classified as 2 story homes. The Gable can also be modified to become a hip roof. In this style, rather than come to a point or gable, the rood begins sloping again. There is also a pyramid shaped roof of this nature known as the pyramid hip roof. These are a few of the most common roof shapes that are seen today. There are many other styles that are more exotic and create unique looking homes, but they are seldom seen today. Aside from the shape of the roof, it is important to consider the material the roof will be made from before making a decision about the type of roof you want. The most common covering for roofs today is the standard shingle. These come in a variety of different colors and styles to match the designed and look of any house. They are typically square or rectangular in shape and are laid in a method that causes them or overlap. This overlapping helps them to transfer precipitation that falls on the rood quickly to the ground and protects the roof from leaking. Shingles are made from a variety of different things. Common materials include ceramic, slate, wood and asphalt. The most common shingle on the market today is asphalt. This is because they are more fire resistant than some types of shingle and more cost effective than others. 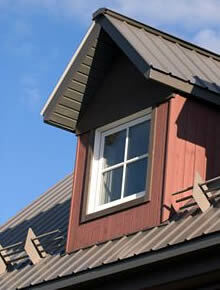 Tin roofs have been around for a number of years and continue to be an important part of home building. Despite the fact that other forms of roofing offer advantages over tin, there are two things that keep it a viable roofing material. The first reason is that tin is affordable and the second is that tin is quite durable. Tin roofs require more insulation than shingle roofs, to help protect from cold and heat loss, as well as sound. For some people, however the sound of a tin rood in the rain is one of its virtues. One of the things that makes tin so durable as a roofing material is that it will be damaged by sale or water that it comes in contact with.